When Krista* first met Tyler* he was fresh out of college on the fast track in product design. He took her to the most interesting restaurants, could fix any machine with his own two hands and owned several rental properties. He would read a book on just about anything and recount the details weeks or months later. He was full of energy and promise. He was the most extraordinary person she’d ever met. Even her family loved him. Six months later they were engaged and by the year’s end married. They had two kids in two years. Right after the first baby Tyler was ecstatic. But as the months went by it seemed that Krista could do nothing right. They conceived again but Tyler grew aloof. He quit his job and went back to school in a totally different subject. He began brooding and drinking every night, sometimes during the day. He was also taking sleep aids and had a prescription for an antidepressant. His mood slowly seemed to get better, but then he would slip away for two or three days at a time. Just after the second baby was born that Krista discovered he was seeing someone else. When he broke the news that not only was he in love with Carmen, but that she was also pregnant with his child Krista knew it was the end. She wondered what she’d done wrong. She tried everything to get the marriage to work, but Tyler was not interested in fixing things or talking about what was happening. He told her he’d already moved on, had started a new business and a new life. It was only after Tyler’s third relationship- with Mia, which also produced a child, that Krista recognized a pattern: two years of mania followed by months of depression and then two years of mania. According to the National Alliance on Mental Health, mental illness affects 1 in 5 adults every year. Nearly 3 percent of adults live with bipolar disorder. It can be difficult to see the signs at first. Many times it takes years to recognize the pattern. Sometimes couples are able to commit to a treatment plan and make a marriage work. Other times the best path is to live apart. Currently about 90 percent of marriages where one person struggles with bipolar end in divorce. The challenge of course is if there are children. Getting professional counseling is always a good option. 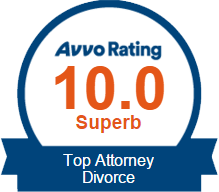 Working with a family law attorney who understands mental illness can also ensure your divorce covers the necessary details and is smooth as possible. *Names and some identifying features have been changed. 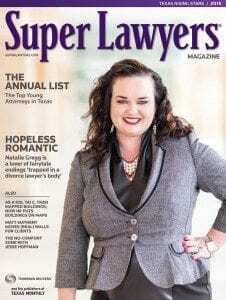 The Law Office of Natalie Gregg is located at 1420 West Exchange in the heart of Allen, Texas. 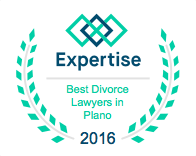 The firm’s family law attorneys serve clients throughout the North Texas counties of Collin, Dallas, Denton and Tarrant.